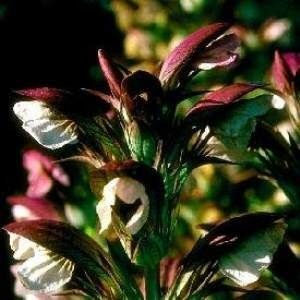 Bear's-breeches are bold specimen plants, very popular with landscape designers. This species forms a clump of huge, deeply-cut glossy green leaves, bearing upright spikes of hooded mauve-pink flowers in summer. A striking cut flower, both fresh and dried. Excellent in the sunny border, best placed where the entire plant can be seen as a specimen. 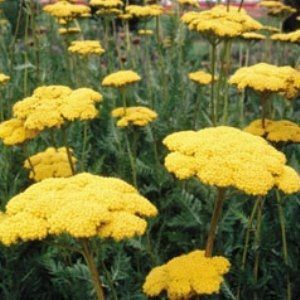 In cold winter regions, grow this in a large container, and bring indoors to a cool, bright frost-free area, or else plan to mulch deeply in late fall. May be divided in spring, and any roots left in the ground will form new little plants. Coronation Gold' is an upright, clump-forming hybrid yarrow which is noted for its deeply-dissected, fern-like, aromatic, silvery to gray-green foliage and its tiny, long-lasting, bright mustard-yellow flowers which appear in dense, flattened, plate-like, compound corymbs (to 4" across) throughout the summer on stiff, erect stems typically rising 2-3' tall. Foliage has a strong, somewhat spicy aroma which persists when used in dried arrangements. Generally considered to be a cross between A. filipendulina and A. clypeolata. Foliage resembles that of the A. filipendulina (fern-leaf yarrow) parent, but plants are more compact.